Harmoniously living with roommates takes plenty of communication and sharing of responsibilities. While learning to share the responsibilities of doing the dishes, cleaning the apartment and taking out the trash are all very important to a good living arrangement, the most important aspect of living together is learning how to share financial responsibilities. The failure to equally share financial responsibilities can lead to a toxic living situation and can destroy a friendship. Luckily, there is an easy way to share financial responsibilities among roommates. The Roommate Expense Tracker Template is a free, easy-to-use template that allows users to equally divide expenses among roommates and track how much each roommate has paid towards their expenses. The first step to using the template is downloading it for free from this site. Once the Roommate Expense Tracker Template is downloaded, take a look at it and determine if the utility names suit your needs. Because the template is fully customizable, you can add utility names if necessary, or you can take away those that do not apply to you. At this time, you’ll also want to add the names of your roommates. Next, you will need to input the monthly expenses that you and your roommates will share. Simply put in the expenses or expected expenses for each month. Once complete, the Roommate Expense Tracker Template will automatically compute how much each roommate must pay for each of the apartment expenses. 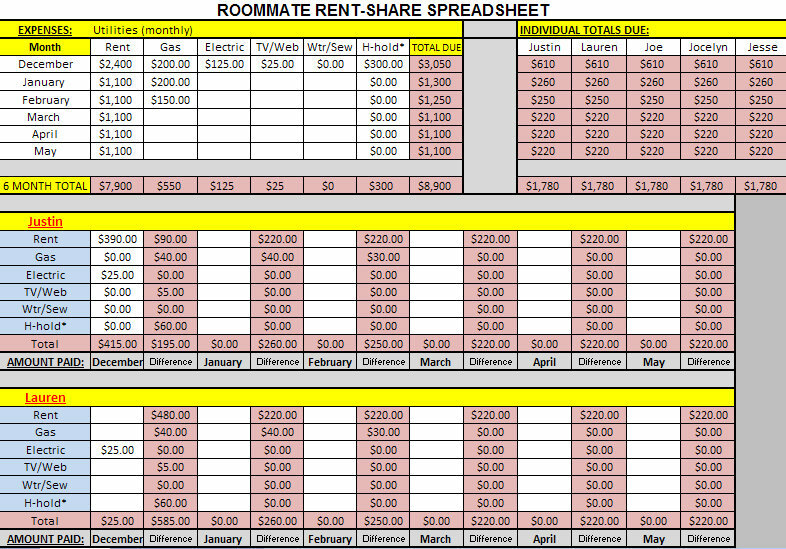 Lastly, as each roommate pays their expenses, input the amount they have paid for the month. 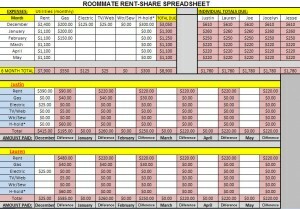 The template will automatically compute how much each roommate has left to pay for that month. Before you begin, ensure that the categories of expenses match the needs of your apartment. Once you change one of the utility names, the other utility names will be changed automatically under each roommate’s name. There is no need for you to change each utility name individually. Only use the template for tracking expenses that all the roommates will share. If an expense is individual or shared by only a fraction of the roommates, you will have to write your own formulas to track those expenses. Learning to share financial responsibilities can be difficult, but the Roommate Expense Tracker Template makes it easy for roommates to track their expenses.